A grieving mother uses her daughter as an artistic muse, complicating and ultimately destroying the girl’s vulnerable adolescence: an achingly straightforward debut set in the Boston suburbs. Four years ago, four-year-old Jonas Begley drowned in the backyard pond while his mother, Marian, was on the phone and 11-year-old sister Nina wasn't paying attention. 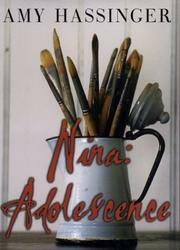 Now, in atonement, Nina has offered herself as a subject for Marian’s paintings in order to draw her out of a prolonged depression. Innocuous enough at first, the canvases soon are all nudes, and as Marian works single-mindedly toward her first big show, she fails to recognize the danger of publicly exposing her daughter's fragile, changing 15-year-old body. Henry, Nina's father, objects vigorously; his clashes with Marian about artistic expression endanger their marriage. Nina, on the other hand, grows increasingly confused. Pursued by big-time art critic Leo Beck, her mother's former lover, Nina falls under his sway, both to get back at her manipulative mother and to assert her own sexuality. Hassinger builds her touching drama with a refreshingly undramatic simplicity, as Nina, a ballet dancer, begins to scrutinize her body as others might see it. Her state of painful disembodiment and the oily Beck’s machinations are torturous to witness; unlike Nina, the reader knows what’s coming. Hassinger keeps the story tightly focused on the surviving family of three, whose tenuous structure is threatened by the few outside characters: Beck; Nina’s bold new friend Raissa, who also serves as a potential sexual partner; and a few objectionable folks in the art world. The author is loath to present any of the Begleys, especially Marian, in an unflattering light, a reluctance that lessens the story’s emotional force. The sad outcome to Nina’s plight is hastily smothed over (relegated to “family therapy”) before the reader has a chance to eperience the climax, especialy with regard to a satisfying resolution between Nina and her mother. Affecting, but lacking real teeth.